Series LFU009 Reduced Pressure Zone Assemblies are designed to protect potable water supplies in accordance with national plumbing codes and water authority requirements. The swivel feature in the series allows for it to be used in a variety of installations, including the prevention of health hazard cross-connections in piping systems or for containment at the service line entrance. springs and replaceable check seats with an intermediate relief valve. Its compact modular design facilitates easy maintenance and assembly access. Sizes 1/2in. – 1in. (15 – 25mm) shutoffs have tee handles. It consists of Cast copper silicon alloy body construction for durability. 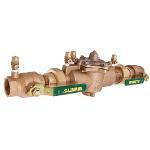 The LFU009 features Lead Free* construction to comply with Lead Free* installation requirements. Maximum Working Pressure: 175psi (12.06 bar).